President Recep Tayyip Erdoğan said Friday that Turkey would open the gates for refugees to travel to Europe if the European Union goes too far on Friday, a day after the European Parliament (EP) approved a motion to temporarily freeze membership talks with Turkey. Speaking at the II. 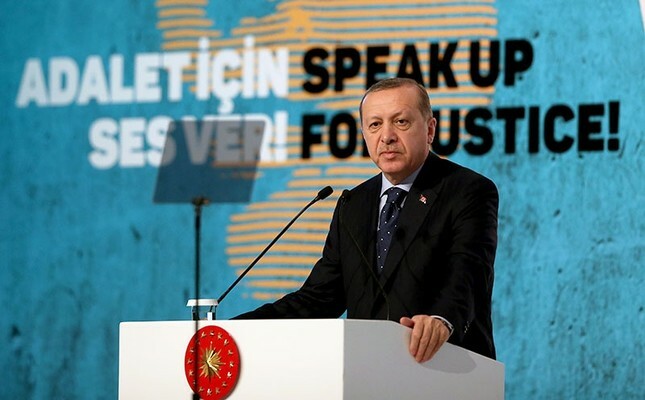 International Women & Justice Summit held by the Women and Democracy Association (KADEM) in Istanbul, Erdoğan said: "You did not keep your word. When 50,000 refugees were at the Kapıkule [Turkey-Bulgaria] border, you cried out. You started to say: 'What will we do if Turkey opens border gates?' If you go too far, the border gates will be opened." "Neither me nor my people will be affected by these dry threats. It wouldn't matter if all of you approved the (European Parliament) vote," he added. Earlier in the week, EU Foreign Policy Chief Federica Mogherini warned that halting Turkey's accession process would be a "lose-lose" move. Referring to the famous case of Syrian refugee toddler Aylan Kurdi, whose body was washed ashore in Turkey in 2015, Erdoğan said: "Now in the world there are millions of Aylan Kurdis waiting for a response, compassion and mercy. Are there any steps taken for them? No. "There are millions of babies, women, all from 7 to 70 in Africa waiting for a solution. And there are no steps taken. Addressing the EU, Erdoğan said: "You have never treated humanity honestly. You did not take 'Aylan toddlers' when they washed ashore in the Mediterranean or 'Omran babies'. "It is us, who are feeding the 3-3.5 million refugees in Turkey. You [the EU] broke your promises", the Turkish president added. Omran Daqneesh is the five-year-old Syrian child photographed in August with his face covered in dust and blood. The image went on to become an icon of civilian suffering in the war-torn nation. President Erdoğan also said during his speech that the controversial legislative proposal to grant clemency to thousands of men currently jailed for marriages with underage girls was not prepared carefully and was thus left open to exploitation. Relations between Turkey and Europe have been stalled by many issues, including the failure of the EU to grant visa liberalization for Turkish citizens as promised in the migrant deal, in addition to EU's indifference to the coup attempt and terrorist organizations attacking Turkey. The EU and Turkey signed a refugee deal on March 18, which aimed to discourage irregular migration through the Aegean Sea by taking stricter measures against human traffickers and improving the conditions of nearly three million Syrian refugees in Turkey. Although Turkey has fulfilled most of the criteria, differences between Brussels and Ankara on Turkey's anti-terror legislation have forestalled the visa-liberalization deal. Membership negotiations between Turkey and the EU began in October 2005, while Turkey has been an associate member of EU's predecessor European Economic Community (EEC) since 1963 and applied for membership to the EEC in 1987. Turkey is also in a customs union with the EU since 1995.